"Strategic Issue II -- Foster Global Awareness and Skill". It's part of the College of Business strategic road map. And Arun and Dave hit the road, and sky, to further the cause. Leaving Moline early afternoon of the 7th means a short hop to Chicago, a little skip to Newark, and the long 7,800 mile jump to Delhi, India. The first legs of this journey go without significant incident. 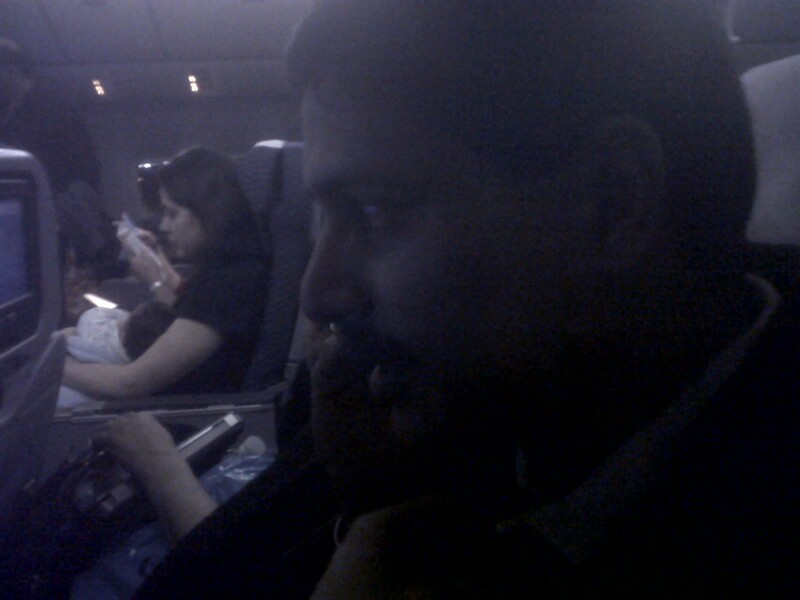 Arun makes a last minute call before takeoff in Newark, and then it's 13 hours in the air toward Delhi. An incredible amount of legwork has gone into preparations for this trip, and they continue all through the journey. Watching the flight data and changing map of flight-in progress gives an appreciation of our age of rapid transit as we cross Greenland, northern Europe and a long diagonal into Delhi. For the less-seasoned traveler (Dave) it is still remarkable to see the external temperature at -82F while our flight speed nears 700 miles per hour. While only an hour into the flight the sights and sounds of India are already all around, from the vegetarian dinner offering to the young mom across the aisle traveling with a remarkably quiet infant. While many are heading home on this flight, we are going another direction, to Delhi, Hyderabad and Pune. 7,800 miles pass in less than 13 hours. In the hour before touchdown we fill out the immigration cards, and my attention is drawn once again to the fact that passports and documentation are serious business -- guard it all carefully. I am thankful that Paul Koch loaned me a passport case to hang around my neck. 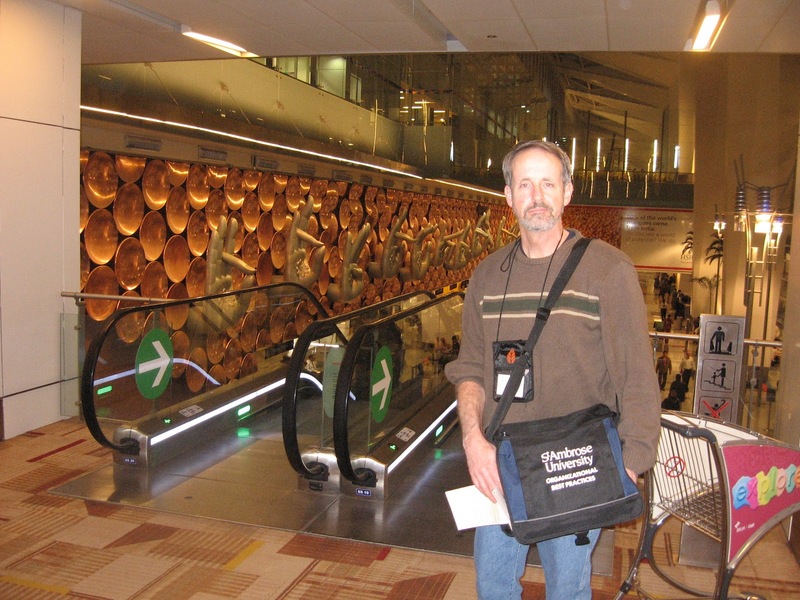 The Delhi airport is spacious and beautiful, with patterned carpeting and a massive remarkable art display over the customs gates, behind me in the picture below. 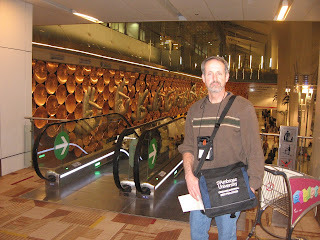 We gather our luggage, find our awaiting car from the hotel and head into a first look at Delhi traffic. One main point here; good thing it was dark during my first ride in the city. Although it is already the 9th as I start writing, I'll post another time after this to give a sense of the place and space as we headed into our visits in Delhi. This is neat. Keep posting! Reminds me of the long trips to China I made (16 hours). Hope your trip goes well. 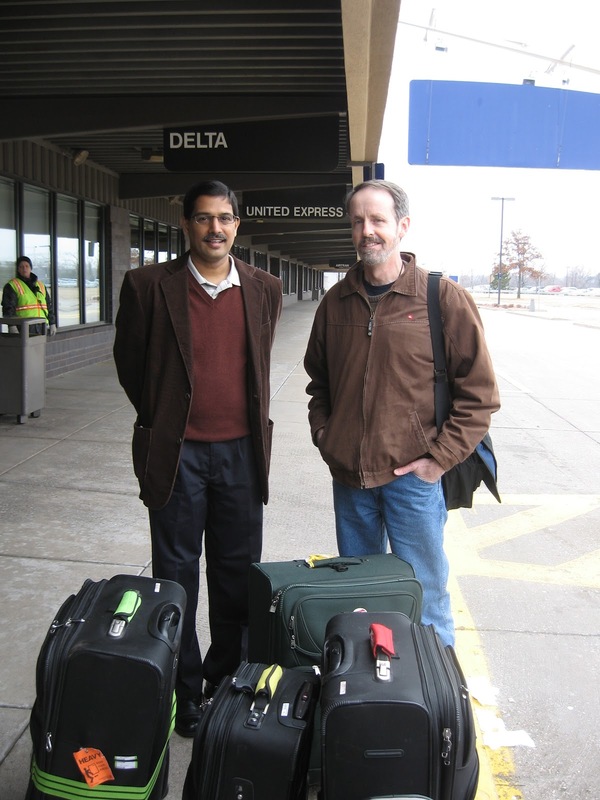 You visited us in IIFT on march 9th -perhaps the first instituition soon after that long flight; all three of you looked so fresh ! I would have loved to read your response to the people you met in IIFT. By the way, Aoto rickshaws of Delhi are very eco-friendly, running on CNG : so its really the greenest ride at such a low cost! !